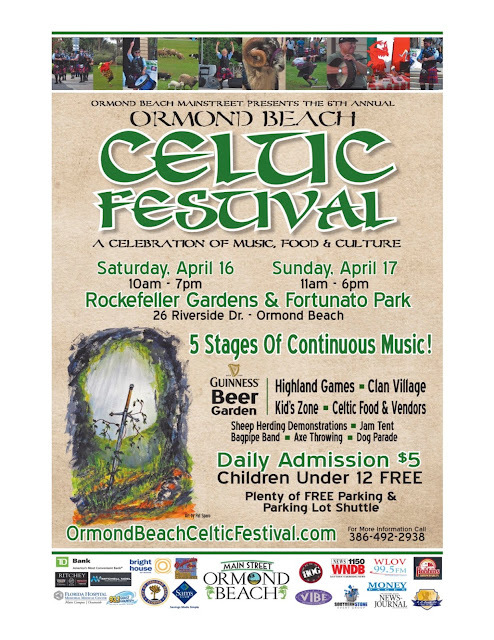 Join us April 16th and 17th, 2016 for the annual Ormond Beach Celtic Festival at the Casements, Rockefeller Gardens and Fortunato Park! The gates open at 10 am on April 16th for two days of music, food and fun at Rockefeller Gardens and Fortunato Park. On the south side of the Granada bridge festival goers will find 3 stages of continuous music, a jam tent, Celtic food, crafts and jewelry and, of course, plenty of Guinness!!! More than 20 bands as well two Celtic dance troupes from the United States, Canada and the British Isles will appear throughout the weekend. Admission is $5 each day for adults. Children under 12 are free and there’s plenty of free parking. This year’s headliner is Patrick Ball.